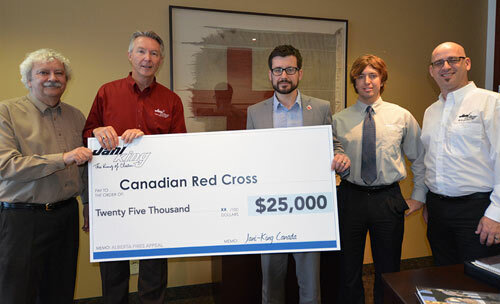 Last month we issued the Jani-King Alberta Fires Appeal to help raise funds in support of the Canadian Red Cross and their efforts providing relief to the tens of thousands Canadians affected by the devastating wildfires in Northern Alberta. The goal: raise a total of $20,000 by matching all donations made to the appeal up to a maximum of $10,000. The final results are in and thanks to the generosity of you – our customers, franchise owners and colleagues; the Jani-King Appeal raised a total of $25,000! We are proud and humbled by the support that this campaign received from our customers, our franchise owners, and our colleagues throughout North America and beyond. On behalf of Jani-King, thank you. Your donation has made a difference to the tens of thousands of people who were displaced by the wildfires, and you can see how by visiting the Alberta Fires Response page at redcross.ca.